What comes to mind when you think about silk? Softness in the texture, the feeling of its smoothness and the appeal of its elegance and shine? Do we actually know where silk comes from, how sts prepared and the work that goes on into producing some of the worlds most finest and beautiful garments from this precious cloth? This week I gained a much deeper and view of silk and its history. I was sent a selection of scarves to review from Demure Look. Previous to this I had always had a fondness for silk and always found it a very feminine and striking cloth especially when it was adorned as a dress or scarf. When I received the scarves from Demure Look, the quality and finish of the scarves really appealed to me. Previous to this I had no idea about the effort and work that went into producing some elegant scarves and needless to say this took me on a journey to find out more about the history of silk. First I turned to Surreya, the founder of Demure Look and asked her for a better understanding of the scarves she produced and the ethos behind the company. She explained to me that Demure Look was born from a passion for naturally produced scarves, especially silk scarves. All over the world people think of silk as an expensive fabric that is the ultimate in luxury, however Demure look wanted to also bring to the fashion world the understanding that the wearing of silk can also benefit your health too. As a professional who enjoys scarves and accessories, Surreya wanted to share her knowledge of the finest and natural materials with the most elegant designs with fashion and ethically conscious women all over the world. As the main material of her products is silk she has opened a section on the Demure Look website enlisting the ‘benefits of silk’ where detailed information about silk and its health benefits can be found on the website.With the increasing desire of customers wanting to purchase more naturally produced scarves made from finer fabrics, Surreya identified that this was something she would like to bring to them to the fashion market. Surreya also explains that all ladies who wear hijabs wear them in different styles suited to their lifestyles and identity and she found this a great inspiration when she and her team began sourcing our products, this led her to include designs and shapes that will cater different tastes as well as cultures. Demur Look is a small company aiming to grow each day. They source their products from different parts of the world searching for the finest materials and unique designs. This is a rectangle scarf made from a silk mixture. 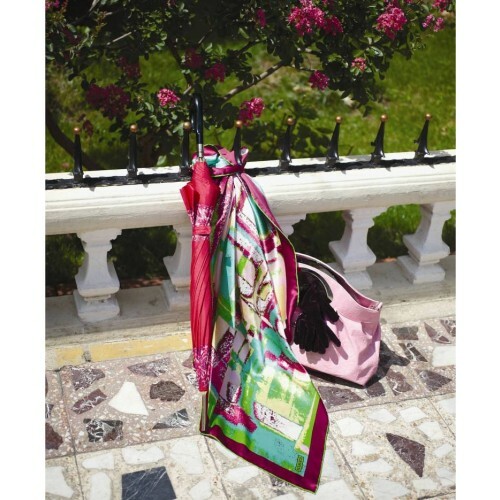 It’s extremely soft and silky and oozes with a beautiful shine which makes it very glamorous. I have used this on the model teamed up with simple head accessories as the scarf needs little introduction, it speaks for itself. The scarf would look best worn for a wedding or a special occasion and I can imagine it being worn with a long ball gown, its perfect for special occasions. This scarf has an extremely beautiful pattern to it, it’s like an exploration of Chinese art laid out on one scarf, the intricate detailing and the fine print of the red, white and black pattern on the silk makes it stand out from afar. 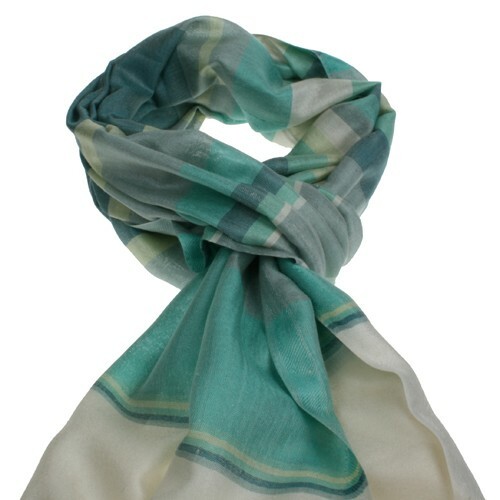 The scarf is larger than normal square scarf and the Silkiness gives it a very elegant and soft touch. I have teamed this scarf with another scarf and used it as a neck scarf on the model however it can equally be worn on the head. It would look very glamorous and sophisticated teamed up with a suit or a dress for meetings and work.